The 3rds travelled to Banbury on Sat 13th for a match against Cropredy 3rds. Downs were put into bat on a very green wicket where bounce was variable! We scored steadily at a rate of between 4 and 5 runs per over throughout our innings, the highlight of which was a terrific 71 by Tom Ling, well supported by double figure scores from Rob Owen, Nick Angus, Alex Owen, Dave Spilsbury and Alex Bellenie..
We reached a total of 199 before losing our final wicket in the 44th over. Given how the pitch behaved, we thought this was a good total, and so it proved. 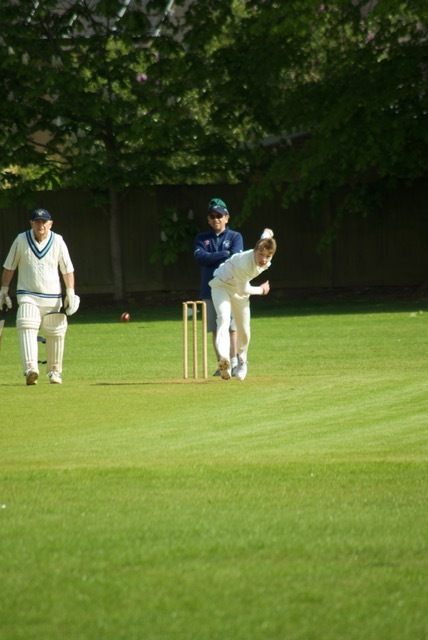 Cropredy made a slow start to their innings thanks to accurate bowling from our four seamers (Dave Spilsbury, Sam Collins, Rob Owen and Ed Owens) backed up as always by very tight fielding. After losing their 3rd wicket with the score at 16, two of Cropredy’s teenagers then batted very resolutely for 20 overs in a partnership worth 80. Our two spinners then each picked up two wickets in the closing 15 overs as we tried to force a victory (Alex Bellenie 8-1-21-2; Alex Owen 7-1-20-2), but we ran out of overs. The match finished as a draw with Cropredy 140-7 after their 45 overs. We earned a very creditable 19 points from the match and look forward to Tiddington 3rds at home next Saturday.